The Ledger News reported August 26 that Lakeland Electric in Florida will be replacing Smart Meters. These are also Sensus, and have the remote connect/disconnect switch. Smart Grid Awareness writes about the domino effect and the fire issue in its article August 27. It is almost impossible to keep track of all of the smart meter fires and related issues. We jump from country to country, from state to state. 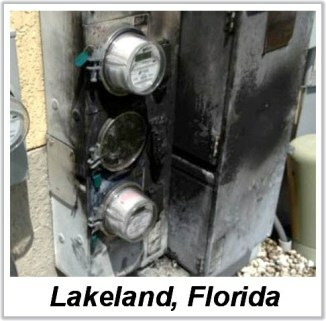 The latest issue is in Florida where Lakeland Electric soon will begin replacing 10,657 residential smart meters over concerns they might overheat, General Manager Joel Ivy said Tuesday, August 26th. Those meters cost ratepayers about $2 million, and now their replacements will cost $1.3 million, plus labor costs to install, making this a very expensive proposition. NVE in Nevada and Alabama Power are just two energy companies using Sensus that are not doing any replacement. Yet. What about the GE fires, the Landis & Gyr fires, the Itron fires? And what happens with other fire and electrical hazard issues not related to the remote connect/disconnect switch, such as tripping arc fault circuit interrupters, burning up electrical outlets and appliances, and causing electronics to mysteriously fail? What happens a year from now when a surge hits and meters explode off walls and start fires? Will the utility companies come up with a new excuse for why there are problems? When Sensus says these issues are systemic in the industry, just what is it referring to? The excuses about the fires — so-called “external” problems — or the fact that there are fires and electrical problems everywhere Smart Meters are installed? This entry was posted in Uncategorized and tagged Alabama Power, NVE, Sensus. Bookmark the permalink.